We are based in Atlanta, Georgia but work with clients around the country as well as globally. We are an efficiently digital bookkeeping and tax preparation company. Schloemer Business Services, LLC is dedicated to providing exceptional customer service to help you achieve financial stability utilizing the latest technology, tools and bookkeeping resources for our clients’ bookkeeping and tax services. We can help you with your bookkeeping concerns to get your finances in order. We have a team of qualified expert bookkeepers, tax preparers to handle the daily daily tasks associated with your finances. Our team of expert bookkeepers and financial professionals tailor all of our bookkeeping support packages to meet your business’ or household’s distinct needs. Whether you’re looking for someone to create a financial plan of action for your small business, or you need a professional to sort out your personal tax preparation – we can help. As your family and your business grow, we grow along with you. Our team stays up-to-­date on all relevant tax codes, and other important laws that dictate how your finances must be handled, so you can continue to keep more money in your pocket. Our customized approach to bookkeeping and tax services means that you can get expertise that works specifically for you. Schloemer Business Services, LLC works with each client based on their individual and small business bookkeeping needs – we are not a one size fits all company. Call us – let’s talk. During our free consultation phone call, we will take time to get to know you and your needs. We’ll then customize our services to help you reach your goals. We look forward to working with you for personal needs or small business needs – your success is our goal! Referrals are the cornerstone of any service business. We, like other professional bookkeeping and tax preparation companies, relies on satisfied clients as the primary source of client referrals. Your referrals are welcomed and most sincerely appreciated! 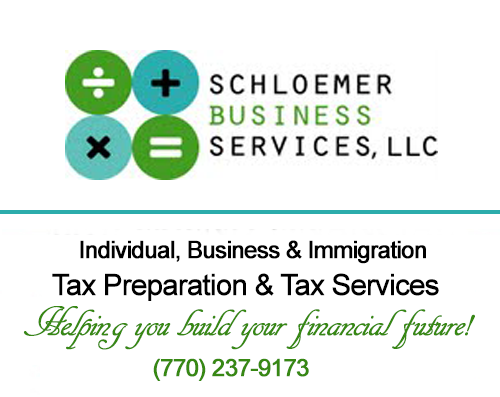 Schloemer Business Services, LLC, an Atlanta based tax preparation and bookkeeping services company works with clients across the United States and around the world. We appreciate your trust in our bookkeeping and tax preparation services. When you refer clients to us, you are expressing your faith and confidence in us. If you have friends or business owners who need professional bookkeeping services, professional tax assistance or immigration tax services, we appreciate your referral. You can be assured that their bookkeeping and tax preparation needs and business services are completely confidential.